James I the Conqueror (Catalan: Jaume el Conqueridor; 2 February 1208 – 27 July 1276) was King of Aragon, Count of Barcelona, and Lord of Montpellier from 1213 to 1276; King of Majorca from 1231 to 1276; and Valencia from 1238 to 1276. His long reign—the longest of any Iberian monarch—saw the expansion of the House of Aragon and House of Barcelona in three directions: Languedoc to the north, the Balearic Islands to the southeast, and Valencia to the south. By a treaty with Louis IX of France, he wrested the County of Barcelona from nominal French suzerainty and integrated it into his crown. He renounced northward expansion and taking back the once Catalan territories in Occitania and vassal counties loyal to the County of Barcelona, lands that were lost by his father Peter II of Aragon in the Battle of Muret during the Albigensian Crusade and annexed by the Kingdom of France, and then decided to turn south. His great part in the Reconquista was similar in Mediterranean Spain to that of his contemporary Ferdinand III of Castile in Andalusia. One of the main reasons for this formal renunciation of most of the once Catalan territories in Languedoc and Occitania and any expansion into them is the fact that he was raised by the Knights Templar crusaders, who had defeated his father fighting for the Pope alongside the French, so it was effectively forbidden for him to try to maintain the traditional influence of the Count of Barcelona that previously existed in Occitania and Languedoc. As a legislator and organiser, he occupies a high place among the European kings. James compiled the Llibre del Consolat de Mar, which governed maritime trade and helped establish Aragonese supremacy in the western Mediterranean. He was an important figure in the development of the Catalan language, sponsoring Catalan literature and writing a quasi-autobiographical chronicle of his reign: the Llibre dels fets. James was born at Montpellier as the only son of Peter II of Aragon and Marie of Montpellier. As a child, James was made a pawn in the power politics of Provence, where his father was engaged in struggles helping the Cathar heretics of Albi against the Albigensian Crusaders led by Simon IV de Montfort, Earl of Leicester, who were trying to exterminate them. Peter endeavoured to placate the northern crusaders by arranging a marriage between his son James and Simon's daughter, when the former was only two years old. He entrusted the boy to be educated in Montfort's care in 1211, but was soon forced to take up arms against him, dying at the Battle of Muret on 12 September 1213. Montfort would willingly have used James as a means of extending his own power had not the Aragonese appealed to Pope Innocent III, who insisted that Montfort surrender him. 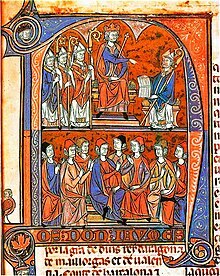 James was handed over to the papal legate Peter of Benevento at Carcassonne in May or June 1214. In 1221, he was married to Eleanor, daughter of Alfonso VIII of Castile. The next six years of his reign were full of rebellions on the part of the nobles. By the Peace of Alcalá of 31 March 1227, the nobles and the king came to terms. In 1228, James faced the sternest opposition yet from a vassal. Guerau IV de Cabrera occupied the County of Urgell in opposition to Aurembiax, the heiress of Ermengol VIII, who had died without sons in 1208. Although Aurembiax's mother, Elvira, had made herself a protegée of James's father, upon her death in 1220 Guerau occupied the county and displaced Aurembiax, claiming that a woman could not inherit. James intervened on behalf of Aurembiax, to whom he owed protection. He bought Guerau off and allowed Aurembiax to reclaim her territory, which she did at Lleida, probably also becoming one of James' earliest mistresses. She surrendered Lleida to James and agreed to hold Urgell in fief for him. On her death in 1231, James exchanged the Balearic Islands for Urgell with her widower, Peter of Portugal. From 1230 to 1232, James negotiated with Sancho VII of Navarre, who desired his help against his nephew and closest living male relative, Theobald IV of Champagne. James and Sancho negotiated a treaty whereby James would inherit Navarre on the old Sancho's death, but when this occurred in 1234, the Navarrese nobles elevated Theobald to the throne instead, and James disputed it. Pope Gregory IX was required to intervene. In the end, James accepted Theobald's succession. After his false start at uniting Aragon with the Kingdom of Navarre through a scheme of mutual adoption, James turned to the south and the Balearic Islands in the Mediterranean Sea. On 5 September 1229, the troops from Aragon, consisting of 155 ships, 1,500 horsemen and 15,000 soldiers, set sail from Tarragona, Salou, and Cambrils to conquer Majorca from Abú Yahya, the semi-independent Almohad governor of the island. Although a group of Aragonese knights took part in the campaign because of their obligations to the king, the conquest of Majorca was mainly a Catalan undertaking, and Catalans would later make up the majority of Majorca's settlers. James conquered Majorca on 31 December 1229, and Menorca (1232) and Ibiza (1235) were later acquired during the reconquest. Valencia capitulated to Aragonese rule on 28 September 1238, following an extensive campaign that included the Siege of Burriana and the decisive Battle of the Puig, where the Aragonese commander, Bernat Guillem I d'Entença, who was also the king's cousin, died from wounds received in action. Chroniclers say he used gunpowder in the siege of Museros castle. Abaqa, the "Khan of Tartary" (actually the Ilkhan), corresponded with James in early 1267, inviting him to join forces with the Mongols and go on crusade. James sent an ambassador to Abaqa in the person of Jayme Alaric de Perpignan, who returned with a Mongol embassy in 1269. Pope Clement IV tried to dissuade James from crusading, regarding his moral character as sub-par, and Alfonso X did the same. Nonetheless, James, who was then campaigning in Murcia, made peace with Muhammad I, the Sultan of Granada, and set about collecting funds for a crusade. After organising the government for his absence and assembling a fleet at Barcelona in September 1269, he was ready to sail east. The troubadour Olivier lo Templier composed a song praising the voyage and hoping for its success. A storm, however, drove him off course, and he landed at Aigues-Mortes. According to the continuator of William of Tyre, he returned via Montpellier por l'amor de sa dame Berenguiere ("for the love of his lady Berengaria") and abandoned any further effort at a crusade. In his will, James divided his states between his sons by Yolanda of Hungary: the aforementioned Peter received the Hispanic possessions on the mainland and James received the Kingdom of Majorca, which included the Balearic Islands, the counties of Roussillon and Cerdanya, and the Lordship of Montpellier. The division inevitably produced fratricidal conflicts. 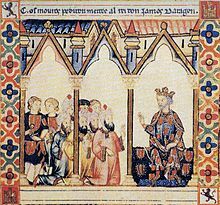 In 1276, the king fell very ill at Alzira and resigned his crown, intending to retire to the monastery of Poblet, but he died at Valencia on 27 July. ^ a b Nicholson 2004, p. 113. ^ Herradón, Oscar (2008). Jaime I el Conquistador, el rey cruzado (James I the Conqueror, king of the crusades). Historia de Iberia Vieja: revista de historia de España (History of Ancient Iberia: review of the history of Spain). p. 15. ISSN 1699-7913. ^ Translated by John Forster. "The Chronicle of James I, King of Aragon, Surnamed The Conqueror" (PDF). Chapter CCLXVI (in Catalan). Retrieved 18 October 2012. ^ Linehan 2011, p. 85. ^ Consejo Superior de Investigaciones Científicas (Spain) (1956). Homenaje a Millás-Vallicrosa. Consejo Superior de Investigaciones Científicas. p. 230. Linehan, Peter (2011). Spain, 1157–1300: A Particle Inheritance. Wiley-Blackwell. Nicholson, Helen J. (2004). The Crusades. Greenwood Publishing Group. ISBN 978-0313326851. The book of deeds of James I of Aragon. A translation of the medieval Catalan Libre dels fets. Trans. Damian Smith and Helen Buffery (Aldershot: Ashgate, 2003) (Crusade Texts in Translation, 10.) Pp. xvii + 405 incl. 5 maps. Quia super limitibus Cathalonie et Aragonum 1243, original document in which James I of Aragon officially writes down the border delimitations between Catalonia and Aragon with all the pertinent lords as witnesses.